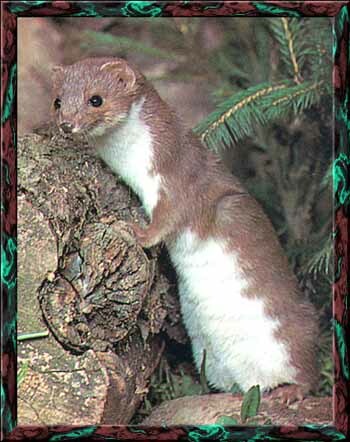 The Weasel is relatively small and slim being about 20 cm long, and is Britain's smallest carnivore. You can find this little chappy all over Europe, North Africa and Northern Asia...gets about a bit doesn't he.. It lives mainly on mice and voles and will go after them into their holes, one weasel can eat hundreds of mice in a year. In the summer it lives mostly in the fields and on the outskirts of wooded areas, but in winter will withdraw deeper into the woods for protection and where food is more plentiful. It moves in undulating bounds, and, if you are trying to spot one it looks like a slim fast moving mouse. 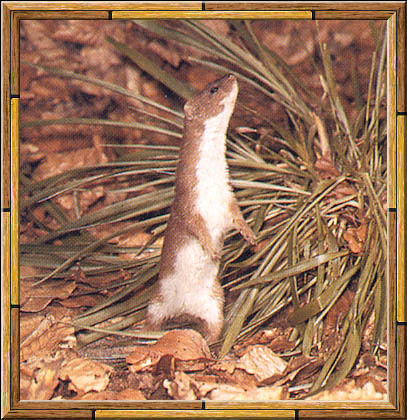 Each weasel has a territory of 10-20 acres, with the territory size depending on the amount of food available. Fur ginger to russet brown, cream below. Long slender body, short tail. Head/body length: Males 194-217mm; Females 173-183mm. Tail: Males 42-52mm; Females 34-43mm.